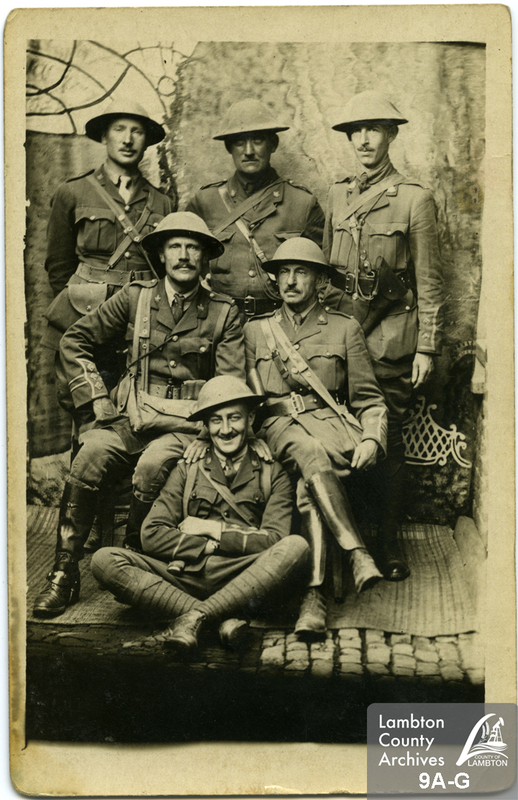 Rare World War One photos and a copy of a Lambton major’s diary written overseas in 1916 are now part of the Lambton County Archives collection. The items, now more than 100 years old, belonged to Major Charles Fairbank of Petrolia, who chronicled the trench warfare in Ypres and the Somme. His grandson, Charlie Fairbank of Oil Springs, donated the diary and the photos, spurred by the Lambton At War exhibit now showing at the Judith & Norman Alix Gallery in Sarnia. This material caught the attention of staff at the Lambton Heritage Museum while they were conducting research to support this exhibit and a lecture series about the major's participation in the First World War. 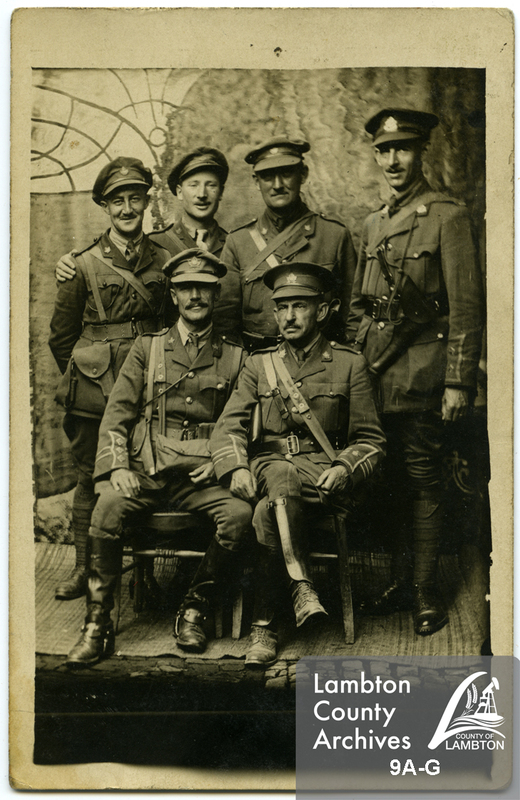 One of the photos being donated shows Maj. Fairbank with his new recruits of the 70th Battalion at the west side of Fairbank’s mansion. It is believed this was taken in 1915. Through some digging, the Fairbank archivist Colleen Inglis was able to piece together the story behind a series of three photos taken with Major Fairbank and five other officers. 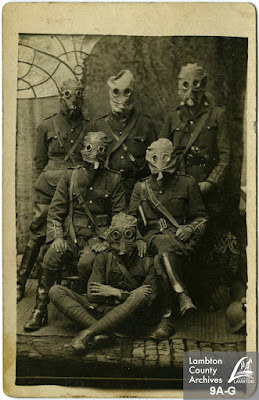 In one, they are in their regular uniforms, in another they wear their helmets and in a third, the same group are posed wearing their gas mask. 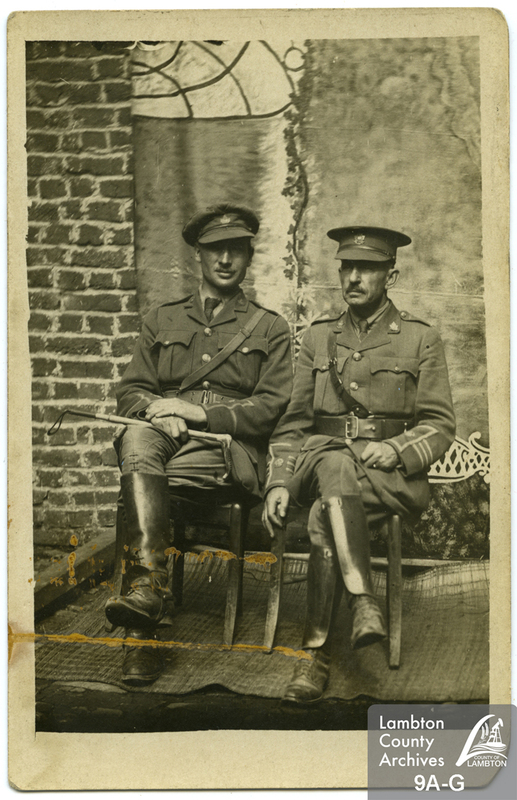 By transcribing Maj. Fairbank’s diary of 1916 to make it more accessible, she determined that the photos were taken on Aug. 24, 1916 in Steenvorde, France. The troops had been billeted and were all sleeping on hay in a barn. Tracking down a newspaper account of the photos in a Forest newspaper in 1916, she was able to identify who is in the photos. “Captured at a peaceful moment, the picture of the men in gas masks is simultaneously lighthearted and terrifying, and it brings the people to life in a way that words alone cannot,” says Inglis. She noted that two of the men, Major S.M. Loghrin and Lieutenant R.B. Barnes were killed less than a month later, on Sept. 15, in the Battle of Courcelette and Lieutenant G.V. Nelson was killed in 1917. Major Fairbank, who was 58 when he went overseas, returned to his family in 1916 and continued to live in the Fairbank mansion in Petrolia until his death in 1925. Earlier, he was the mayor of Petrolia, and the county warden. He was also a medical doctor, owned Vaughn and Fairbank bank as well as VanTuyl and Fairbank Hardware and was an active oil producer. “These pictures are a unique and fascinating snapshot of history,” says Lambton County Archivist Dana Thorne. “They tell an important local story by featuring a prominent Lambton citizen, Charles Oliver Fairbank, but they also tell an important international story by situating him in France in the middle of the First World War. Special thank you to Pat McGee for writing this blog post!